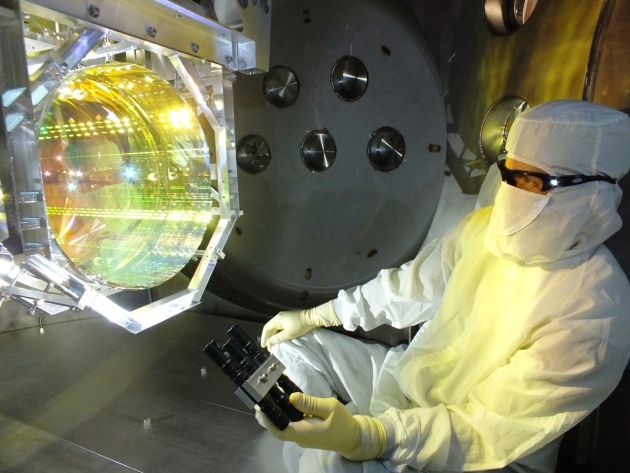 The existence of Gravitational Waves have been confirmed. But you probably have heard that. In this post, we will break down this profound discovery into comprehend-able chunks. This is going to be a amazing journey. Ready ? where objects are assumed to exerting a force upon each other. What is the Space-Time Fabric? cloth curves. This is exactly what happens in the solar system as well. has been made by the sun. Attributing to the various masses of objects, the way they bend this fabric also varies. If you drop an object in a medium such as water, they produce ripples that propagate as waves through the medium. Similarly, Gravitational waves are ripples in space-time fabric produced when you drag heavy objects through space time. And the nature of these waves is that they don’t require a medium to propagate. Everything with mass/energy can create these waves. Two persons dancing around each other in space too can create gravitational waves. But the waves would be extremely faint. You need something big and massive accelerating through space-time in order to even detect them. And orbiting binary stars/black holes are valuable in this retrospect. How can you detect them? Let’s turn to the problem to detecting them assuming you do find binary stars/black-holes in the wondrous space to suite your needs. Here’s where the high school fact that the speed of Light is a constant no matter what plays an important and pivotal role. If the space expands, the time taken for light to reach from A to B would be longer. And if it contracts, the time taken for it to reach from A to B would be smaller. By allowing the light waves from the contraction and expansion to interfere with each other, such as done in any interferometry experiment we can detect the expansion or contraction. Voila! Two Black Holes with masses of 29 and 36 solar masses merged together some 1.3 Billion light years away. Two Black Holes colliding is the header animation of the ‘Black Holes are not so Black Series’, in case if you haven’t noticed. The merger of these two black holes results in the emission of energy equivalent to 3 solar masses as Gravitational Waves. with a time difference of 7 milliseconds. And with the measurement of this time difference, physicists have pronounced the existence of Gravitational Waves. All this is most certainly easily said than done and requires meticulous and extensive research, not to mention highly sensitive instruments. to collide and maybe even build more sensitive instruments to detect these waves. And Einstein predicted this a 100 years back! Note: Hope you are able to understand and appreciate the profundity of the discovery done by mankind. Why is this discovery a Big Deal ? the oblivion towards a theory of everything. are markers to getting there. What is this Image that i see everywhere? This is not the photograph of the actual event but a simulation run by NASA of two black holes merging. How does the actual experimental setup look like ? half jointly to Barry C. Barish and Kip S. Thorne “for decisive contributions to the LIGO detector and the observation of gravitational waves”.